Rajeev Kathpalia (Vastu Shilpa Consultants) and Anna Rubbo talk about the design, planning and research outcomes at Global Studio Bhopal (2012) and how seeds are sown to transform practice. From 2005-12 Global Studio emphasized improving the lives of the urban poor, and creating an international network of urban development professionals with a commitment to participatory processes. Global Studio worked to support the 2000-2015 Millennium Development Goals (MDGs), and to introduce the goals to urban development students and professionals through practical action and co-production with disadvantaged communities. Global Studio ran over a period of seven years in four countries, doing useful work in a number of communities. Located in the Faculty of Architecture and Planning in the University of Sydney, Global Studio began in Istanbul (2005), then Vancouver (2006), Johannesburg (2007-09) and Bhopal (2012). Some 600 students, teachers and professionals from over 35 countries,11 disciplines and 66 universities as well as many members of local communities took part in this ‘think and do tank’. Global Studio created a strong ethic around civic engagement in urban development, and nurtured the skills urban professionals need to work with ‘people as partners’. Global Studio responded to the critique of urban professionals that ‘they don’t listen’. Istanbul Congress organizer Suha Ozkan, ITU, and METU’s Aydan Balamir and Muge Akkar. University of Sydney students Bryna Lipper, Josh Morrin and Alex Miller helped develop and implement the first Global Studio in Istanbul. Many academic and professional colleagues from around the world supported GS Istanbul, as well as subsequent Global Studio’s and its associated conferences in Vancouver, Johannesburg, and Bhopal. A special acknowledgement to the University of British Columbia (Mari Fujita), the School of Planning and Architecture at Wits University (Alan Mabin, Phil Harrison, Garth Klein, Peter Rich), the New School NY (Michael Cohen and Adriana Abdenur), Diepsloot Community Development leader Sam Sikhosana, and MANIT Bhopal (Krishna Dhote, Preeti Onkar, Krishna Shresthra, Savita Raje). In Diepsloot township, Johannesburg, Sticky Situations partnered with WASSUP and DACN to improve sanitation and advance local arts and culture. Beginning 2012, Healthabitat and WorldSkills plumbers collaborated with WASSUP to upgrade toilets that offer ‘dignity’ to residents. Such work demonstrates that a successful transition from academic to community led development is possible. The traveling exhibition People Building Better Cities was a joint project by Global Studio and the Center for Sustainable Urban Development in the Earth Institute at Columbia University. Funded by a grant awarded to Anna Rubbo, Megan Bullock and Matthias Neumann in 2012. Devangi Ramakrishnan, Jennifer van den Bussche and William Chan also contributed to PBBC development. A very special thanks to Megan Bullock (MESH) for her superb graphics. From February 2013 to October 2015, PBBC traveled to 18 cities and 10 countries. In each city there was a public program to explore issues that PBBC raised. In this way PBBC themes such as inequality, population and slums, climate change, innovation in education and civic engagement in urban decision making were canvassed from a local perspective: in Bangkok, Rio de Janeiro, Sydney, Johannesburg, Nairobi, Beijing, Shanghai, Mumbai, Chennai, Delhi, Cincinnati, New York, Medellin, Durban, Brisbane, Christchurch and Ann Arbor. PBBC shows the Global Studio philosophy, principles, priorities through selected projects. It includes 20 possible actions that can help make cities more equitable and improve the lives of the urban poor. Participatory design and planning – and the ways in which communities can come together to inspire new ideas for urban space – is an exhibition theme, illustrated also by the work of Healthabitat Australia, the Community Architects’ Network in Thailand, Archive Global and BRAC School of Architecture in Bangladesh. If you would like to see the exhibition, please download the PDF of the exhibition panels and the accompanying handout. The panels are available in English, Portuguese, French, Spanish, Chinese and Hindi. See also People Building Better Cities Facebook page. We are grateful to Columbia University and GSAPP’s Studio X program for hosting PBBC in Rio de Janeiro, Mumbai, Beijing and Johannesburg. We are grateful to GS alumni and mentors around the world who helped make it possible to show PBBC in these cities. Global Studio became an associate partner in the UN-Habitat World Urban Campaign. Shresthra, Krisha K; Ojha, Hemant,; McManus, Phil. ; Rubbo, Anna. ; Dhote, Krishna K Inclusive Urbanization: Rethinking policy, practice and research in the age of climate change, eds (Routledge). Anna Rubbo collaborated with CSUD, IIGH (International Institute of Global Health), the Columbia Urban Design Program and the Universidad Pontificia Boliviana to show PBBC and offer events at WUF7 (Medellin, 2014). Jose Siri, Megan Bullock, William Chan, Geeta Mehta, Ximena Vargas, and Pontificia students fielded questions over five days. Global Studio’s Anna Rubbo, Rodney Harber and Jennifer van den Bussche partnered with UIA to offer a three-day focus area on “Addressing Poverty and Informality through Design Education and Practice”. We showed PBBC, and Diepslooters Lucky Nkali, Papi Sathekge, Bernard Maluauzi, Lerato Monama, Junitha Mohlogo Kgatla and Thabo Mopasi (from Alexandra) took part in the conference. They also helped field questions about the exhibition and Global Studio work in Johannesburg. Sandra Plaza, Peter Nguyen, William Chan, Paul Pholeros and Devangi Ramakrishnan participated in PBBC events. Anna Rubbo was pleased to accept the UIA Vassilis Sgoutas Prize mention for “educational and humanitarian work” on behalf of Global Studio. The MDGs ran their course, ending in 2015. Since 2015 the SDGs (Sustainable Development Goals) have begun to guide policymaking and practice, and form the centerpiece of the 2030 Agenda for Sustainable Development. Goal 11 ‘Make cities and human settlements inclusive, safe, resilient and sustainable’ brings a new focus to cities; the New Urban Agenda will provide a roadmap for implementing Goal 11. CSUD, Sticky Situations, and the Columbia University Urban Design Program partnered to offer an event at Habitat III, where the New Urban Agenda (NUA) was launched. Anna Rubbo, Jen van den Bussche, Silvia Vercher, and Justin Garrett Moore proposed a new Network to link educators working towards the SDGs. 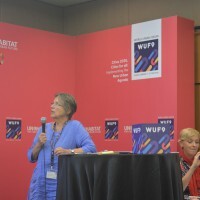 CSUD partnered with Perkins Eastman NY, the Federal University, Rio de Janeiro, Sticky Situations and WASSUP, Johannesburg and Co.Creation Architects, Bangladesh to offer a networking event at WUF9 (Cities for All: Implementing the New Urban Agenda). 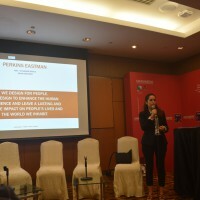 The Agenda 2030 Studio Design and Planning Studio was launched in Kuala Lumpur. In essence the Local Projects Challenge will aim to increase SDGs and New Urban Agenda awareness and implementation worldwide, through hands-on experiences at the local level, with mechanisms for sharing outcomes and learning. We hope to engage with ‘city makers’ in education, the urban professions and civil society. Please see this brief summary of the Local Project Challenge. Part 1 of the project is a Survey which asks the question, ‘How are the SDGs traveling in your world?’. Part 2 will invite local partners to engage in local projects that are useful and respond to the SDGs during 2019 by the online submission deadline of December 7, 2019. There are five easy to follow guidelines, including the Global Studio principle of working with ‘people as partners’ and participatory planning and design. All projects will be shared online, with selected projects shown at the next World Urban Forum in Abu Dhabi in February 2020. Travel scholarships for selected teams will be awarded, so they make take part in events at WUF10. Selected projects will also be shown at UIA 2020, to be held in Rio de Janeiro in June 2020. CSUD affiliates and GS alumni William Chan (Sydney), Jennifer van den Buscche (Johannesburg) and Devangi Ramakrishnan (Pondicherry) are contributing to project development, as are New York architect Silvia Vercher and project partner Vera Tangari (Federal University, Rio de Janeiro).